At any rate Nick Kelsh and I were tooling around the trade show in New York looking at all the cool new video stuff when I can across a small table whose inhabitants specialized in "viewer technology." They had all kinds of viewfinders and hoods and shades for the LCD screens that hang there on the backs of still and video cameras. I found the biggest, meanest, gnarly-est one I could and measure it with my pocket laser rangefinder/caliper system to make sure it would fit on the backs of my Samsung NX 300 and my remarkably cool Pentax K-01's and then I borrowed a hundred bucks from Nick and bought one. It actually occupies more cubic space than either my Pentax or my spunky little Samsung. And it's photographic comedy to see it in use....but now I can get my money's worth out of those expensive little flat panels that keep showing up on the backs of otherwise perfectly good cameras. The company that sells this is called, Swivi and I think the product is a bargain at $100. It's got an eyepiece blind (for what? I'm not sure...) and a big diopter adjustment ring that's made out of metal. You can see that the rubber eyecup is steroid enhanced. Absolutely hulking. You'll think you've gone back to the eyecup on your Arriflex 16S. 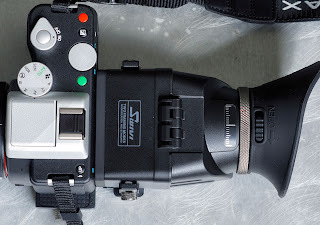 The loupe construction is hinged so you can flip up the magnifying element and look at the shaded LCD directly or hold the camera at arm's length in classic, stinky baby diaper--daddy needs glasses" style. Wonderful for new school or old school. Best of all this beast bolts onto the bottom with belligerent bravado. The all metal mounting hardware is a salad of metal bolts and rods that allows the unit to be custom fit to just about any camera with a tripod socket. Shifting left and right or up and down is easy and when you've got it where you want it the whole thing locks down tightly. And wearing it with a diminutive camera will make you look like the biggest photo nerd in the area. But I'll still bring it around with me when I actually want, or need, to see what's on the screen at midday in the blazing sun. YMMV. nothing occludes the Marc Newsome signature on the bottom of my camera. And secondarily, nothing gets in the way of the battery compartment. The one fly in the ointment? You lose your tripod socket. I'm a spectacle wearer with the beginnings of cataract, so sun glare on LCD and sideways into EVF is a serious problem. In cold weather the solution is simple and cheap. A wide black scarf which can be thrown over both head and camera. A modern miniaturised version of the old glass plate photographer's cloth hood. And I don't need to mention the many other photographic utilities of a big wide black scarf. In hot weather another solution is simple and cheap. The legionnaire's cap. It has a neck curtain, as popularised by Japanese extras in WW2 movies. Swing it round back to front and throw the neck curtain over the camera. Once again the sun glare problems are replaced by a perfect view. And anyone who feared that age might have dimmed your eccentricity is reassured. That's my same setup on the K-01 except I usually have the 18-135mm. Its comically wonderful! 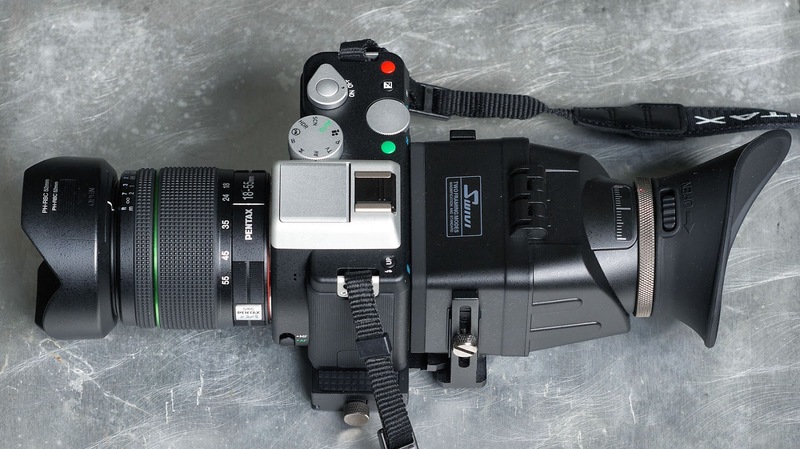 I thought that was a Medium Format camera when I first saw it. Good luck with your viewer blind on steroids. I smiled and shook my head when I read this post, Kirk. I got to PhotoPlus late on Saturday and just missed seeing you at the Samsung booth-- you were walking out just as I was walking in. (I did hang around long enough to watch Nick work with Naomi, and was impressed at what he was able to achieve in the very small studio space you were given to work with). I passed on the Hoodman (reluctant to spend $200 on a finder for a camera that only cost me $300), but I did some online research and ordered a $60 'Hoodeye' finder yesterday. 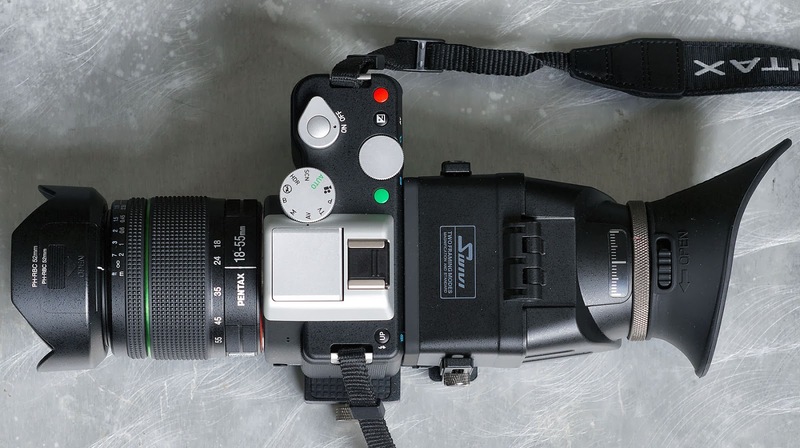 It looks quite like your Swivi, with a similar eyecup, hinged design, diopter correction, etc. It hasn't yet arrived, but I have high hopes that I can finally warm up to using the K-01. Hope that you enjoy yours-- keep us posted with a field report. If you want to do video with a DSLR, these things are essential. Can't critically focus on my Canons without one. I don't see a lost tripod socket at all. I see a loupe, shade and quick release plate all in one. It looks like the base plate is Arca compatible. (other blogs show the Swivi mounted to a fluid head tripod) Since I've switched all my quick releases to Arca types, this one looks like a winner to me. $100 looks like a convention floor special. Can't find it less than $145. When I read the words "Absurd Purchase" in this post's title I immediately wondered if you had bought a Hasselblad Lunar. 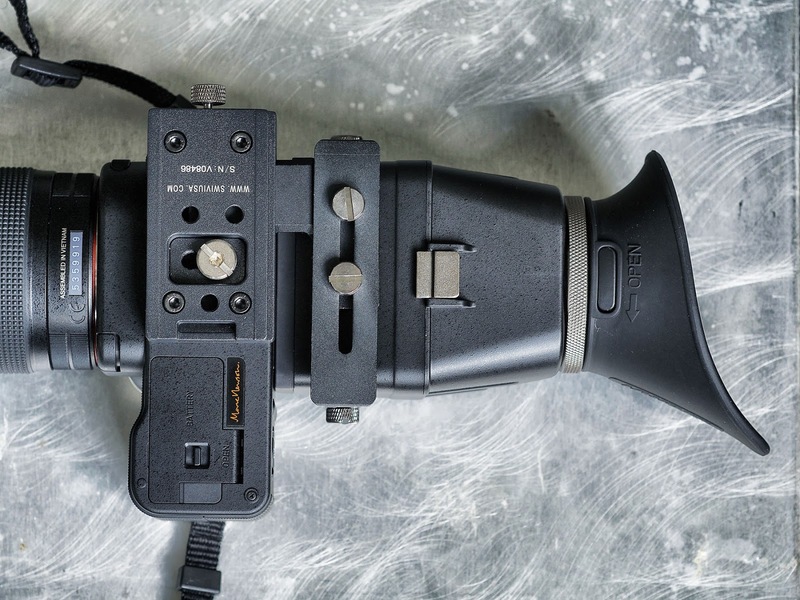 Your loupe purchase actually seems to be a rather practical one. I'm a bit surprised, however, that there is no tripod socket on the mounting plate. Are you sure that none of those three holes surrounding the center screw are threaded? I use the Hoodman system on my K-01 and K5. When you place the Hoodman along with an old Pentax A 400mm lens on a K-01 it no longer looks like a little K-01 system but with that said it is hard to live without hood loupe when focusing a long manual lens.